It isnt availiable as plans and the hull is a fibreglass shell that the wooden deck is built on. 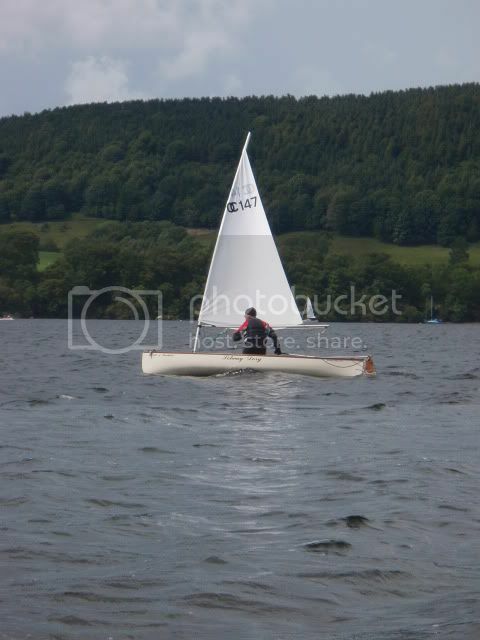 This is the "Cream of Manchester": finest looking sailing canoe I've ever seen! Seems like half a a lifetime ago! I believe that she's currently for sale. This is a bit of a surprise to me as her owner has been a regular at OCSG meets over the last year while I've been involved. I can confirm she's a lovely canoe as I've had a sail in her (and fallen out of her! ). If the OP or anyone else is seriously interested they could PM their contact details to me (or maybe Dave S?) and I'll forward them to the owner. I have no idea how much he's looking for. 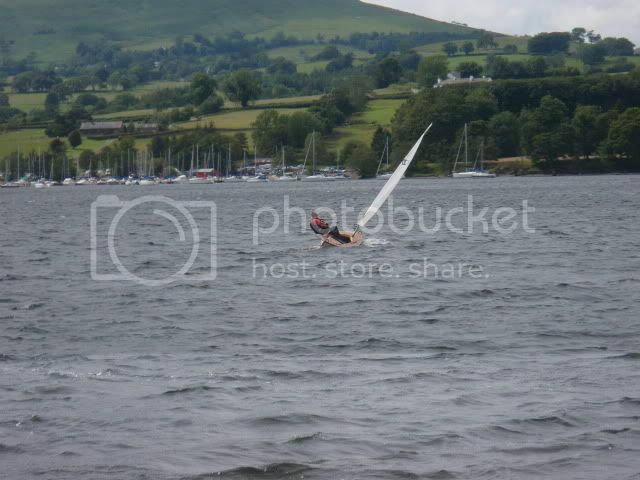 Here she is under sail on Ullswater. Great pics Chris. Am I right in saying this design is more towards the 'sailing canoe that only gets sailed, not paddled' end of the spectrum? I ask because it would seem to me to be less suited to conventional paddling with the paddler situated in the middle like that on a broad beamed boat. I'm sure she flies along though. It is a sailing canoe, that can be paddled, rather than a paddling canoe that can be sailed. It is easiest to paddle such a canoe with a long double paddle, although it can be paddled with a single paddle. A canoe with a rudder can be paddled without the corrective J stroke because with the tiller tied of centrally the canoe will track like it is on rails. I can't comment on what it's like to paddle but the difference between sailing my Royalex canoe and this canoe (which is designed primarily to sail) is pretty huge. It accelerates so much faster and feels so much more stiff and responsive than a plastic boat. It's simply the right tool for the job if you want to sail.